Rattle That Lock is an intimate album with genuine feeling and heart, and Gilmour shows without question that his talents have not diminished. 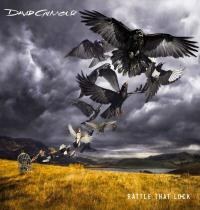 David Gilmour’s first solo album in nine years, Rattle That Lock is a musical journey of love, sorrow and hope. The album follows a loosely structured narrative that touches on thoughts and feelings experienced over the course of a day. Gilmour’s wife, the novelist Polly Samson, wrote many of the lyrics, as she has for Gilmour since Pink Floyd’s 1994 album The Division Bell. Although it is bound by a conceptual framework, Gilmour isn’t trying for a Pink Floyd-style epic. Every time it feels like Gilmour’s going to break out into an extended guitar solo, he always reins it back in. That said, there are moments throughout the album that sound very much like Pink Floyd is reborn. When you’re David Gilmour, you can bring in a veritable wealth of legendary talent to play on your album, and he does exactly that. Roxy Music’s Phil Manzanera and Andy Newmark appear on several tracks. David Crosby and Graham Nash provide vocal support. Jools Holland of Squeeze and Roger Eno add piano. The great Robert Wyatt plays the cornet on one track. Ace drummer Steve DiStanislao and acclaimed bassist Yaron Stavi play on much of the album. Percussionist Danny Cummings, known for his work with Mark Knopfler and other luminaries, plays on several tracks. Bob Close -- who was in the early version of the band which would become Pink Floyd -- plays guitar on one track. For the string arrangements, Gilmour again goes big: Polish film score composer Zbigniew Preisner’s orchestrations are all over the record. It’s an enormous array of talent, and the result is a highly polished and mature work of dignity and warmth. The stunningly beautiful instrumental opener, “5 A.M.”, is like diving into the same universe as “Shine On You Crazy Diamond” 40 years later. It’s a showcase for Gilmour’s richly toned guitar which blazes over the glimmering keyboards. The only downside is its brevity; 3:05 is not nearly enough. It’s barely a blip. Then comes “Rattle That Lock”, a bluesy rocker that occasionally sounds vaguely reminiscent of “Money”. The 69 year-old Gilmour’s voice has turned thinner and more gruff as the years have gone by, but by no means is he feeble, and “Rattle That Lock” is an engaging and energetic track with terrific background vocals by Mica Paris, Louise Marshall and the Liberty Choir. “Faces of Stone” is a languid ballad with more dazzling guitar work. It’s a majestic, melancholy piece about the heartbreaking confusion and sorrow that sets in like a fog in the mind of someone growing older. Again, though, it fades out curiously early, just as Gilmour’s guitar is really heating up. Even at five and a half minutes it feels like a tease. “A Boat Lies Waiting” is a solemn, atmospheric piece built on piano with sounds evocative of the sea woven in. It’s a stately remembrance of the late Pink Floyd keyboardist Richard Wright, whose voice at one point bubbles to the surface like a ghost. The solemn piano introduction was recorded 18 years ago, the year Gilmour’s son Gabriel -- who plays piano on “In Any Tongue” -- was born. Gilmour harmonizes on the track with David Crosby and Graham Nash; it’s like Meddle merged right into Deja Vu. “Dancing Right in Front of Me” is another haunting ballad. It’s a contemplation of parenthood, and all the associates emotions that come with it: the sorrows and joys of life, and the constant worry. “In Any Tongue” is a reflection of a world rent by violence and depravity. “Beauty” is a four and a half-minute instrumental that begins with spectral keyboard and piano, with Gilmour’s guitar echoing the piano line at first before swirling into a dreamy, leisurely guitar piece that’s utterly sublime. “The Girl in the Yellow Dress” is a step back in time to a smoky jazz club, with ornate piano by Jools Holland, Chris Laurence on swinging double-bass, and Colin Stetson providing smooth saxophone riffs. “Today” is the other uptempo rocker, and again it’s hard not to think back on “Have a Cigar” or “Run Like Hell”. As the album eases toward its end, Gilmour turns positive, with the thought of living for the moment, making the most of every waking hour foremost in his mind. “Feel that sun on your back / see the shadows falling / sea meets shore and soothes it with a song / if this should be my last day on earth, I’ll sing along". The album closes with another otherworldly instrumental, “And Then…” It’s an epilogue of beauty and grace, Gilmour’s crystalline guitar soaring like a restless spirit spiralling out into space. It fades out with a few strands of acoustic guitar, the sound of a fire crackling in the night, and the faint cry of a nightbird in the distance. At 51 minutes it’s hard to argue that Rattle That Lock somehow doesn’t deliver or is too short, yet that’s how it feels at times. It could have been more expansive and epic. Still, it’s an intimate album with genuine feeling and heart. David Gilmour, who is undoubtedly one of the most important forces in rock music over the last 50 years, shows without question that his talents are undiminished. Rattle That Lock is a solid addition to his remarkable body of work.